An·glo [áng gl?] (plural An·glos) or an·glo [áng gl?] (plural an·glos) noun (informal) 1. Hispanic non-Hispanic white person: an English-speaking white person in the United States who is not of Hispanic origin 2. Canada English-speaking Canadian: an English-speaking person in Canada, especially in Quebec [Early 19th century. < Anglo-] Anglo is the counterpart of Latino/Latina or Hispanic. In one sense it refers to any white person whose first language is English and whose descent is not Latin American or Hispanic. 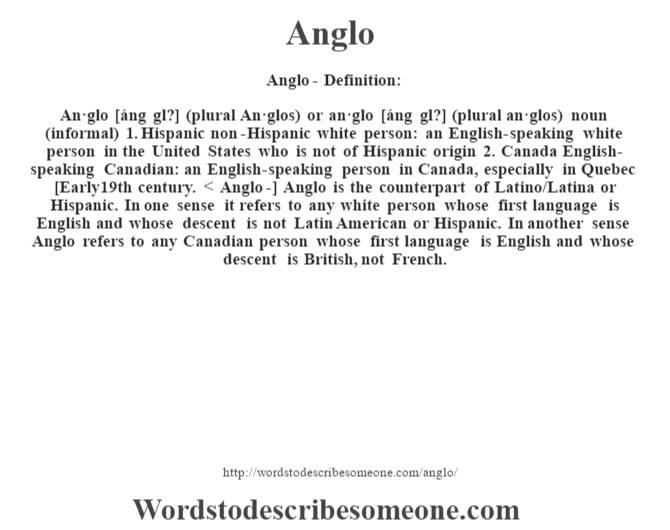 In another sense Anglo refers to any Canadian person whose first language is English and whose descent is British, not French.